Flight Centre is offering a promotion on flights from Calgary to Australia, New Zealand, Fiji, Tahiti, and the Cook Islands. 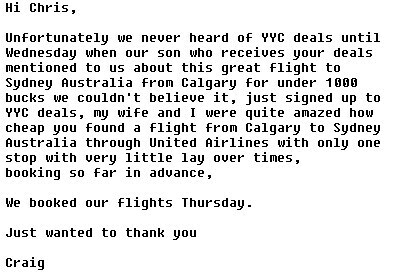 When you combine this promo with the fact that Air Canada, and Qantas are currently offering some already historically low prices from Calgary to Australia, you can find some really excellent prices, especially considering the flights have just 1 stop, and it's within Canada (via Vancouver). Availability: Air Canada is currently showing 1-stop flights between Calgary and Brisbane for $1022 CAD roundtrip including taxes in late August, early September, the second half of October, and the first half of November 2016. They are also showing them in February, March, April, and May 2017. Availability: Air Canada is currently showing 1-stop flights between Calgary and Sydney for $1026 CAD roundtrip including taxes in late August, early September, October, and the first half of November 2016. They are also showing some in the second half of February, March, early April, and May 2017. Availability: Air Canada/Qantas is currently showing 2-stop flights between Calgary and Melbourne (via Vancouver and Brisbane) for $1092 CAD roundtrip including taxes in late August, early September, the second half of October, and the first half of November 2016. They are also showing them in February, March, April, and May 2017. Update 9/6 - The Flight Centre promo is over, but Calgary to Sydney, Australia can currently be had for $941 CAD roundtrip including taxes. Brisbane is $2 more. Melbourne is $18 more. calgary, yyc, flight deals, air canada, sydney, australia, syd, air new zealand, qantas, australasia, oceania, melbourne, mel, brisbane, bne, south pacific, fiji airways and air tahiti nui. 4 Responses to "Calgary to Brisbane or Sydney, Australia - $926 CAD roundtrip including taxes | 1-stop flights via Vancouver"
It is a very good deal from Calgary. I'd like to know why it is not extended to Edmontonians. The Flight Centre promo itself ends on Aug 31. 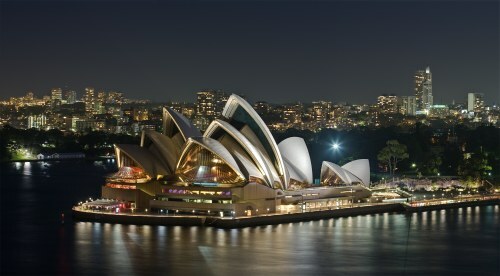 The promo is for $100 off of any roundtrip flight to Australia (with the airlines mentioned). The airfare prices themselves can change at any time. So it's a matter of using the promo in conjunction with an airfare price that's already quite low, to score a really great deal.